Its name means “icy mountain”. 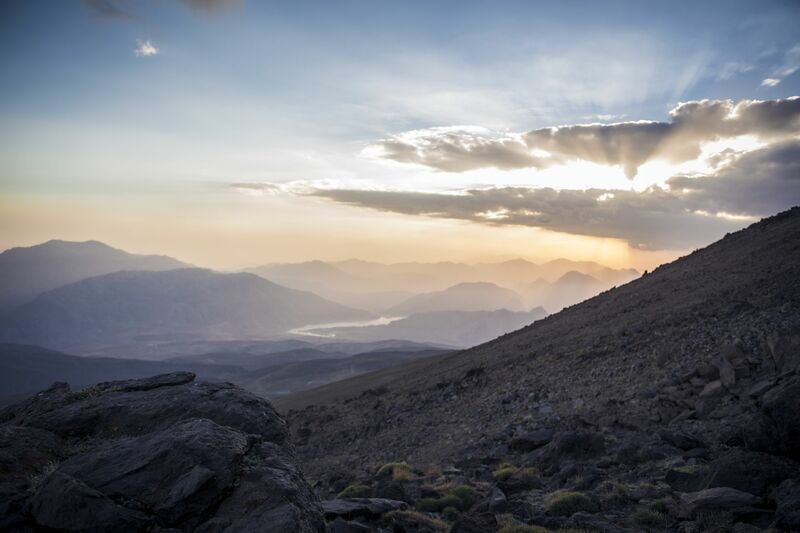 Damavand, to the north-east of Teheran in Iran, is the highest mountain in the Near East and one of the highest free-standing mountains in the world, next to Kilimanjaro. 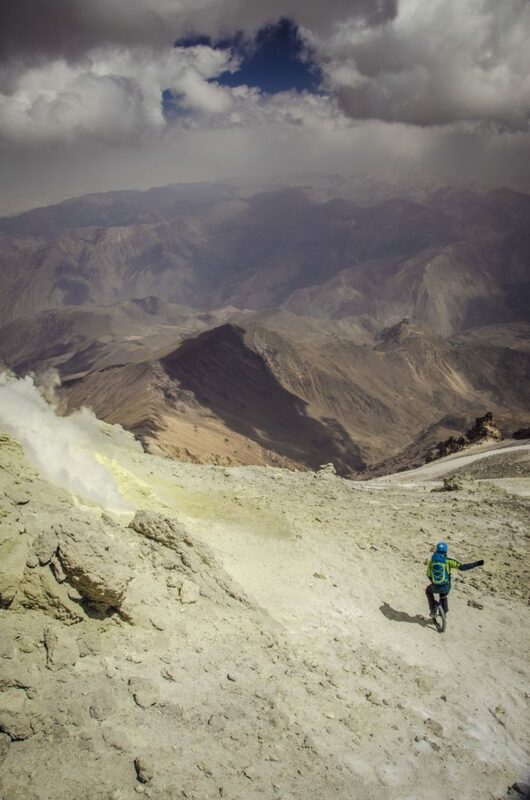 Although the summit can be reached without having to climb, the 5671-metre mountain is still a major challenge in terms of fitness and mountaineering skills. 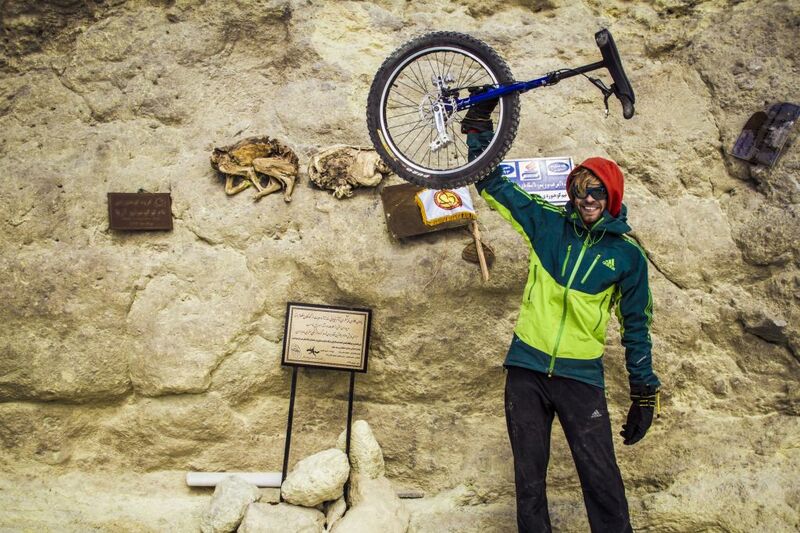 Exactly the right place for Germany’s top mountain unicyclist. I would never have thought it would get so hard. 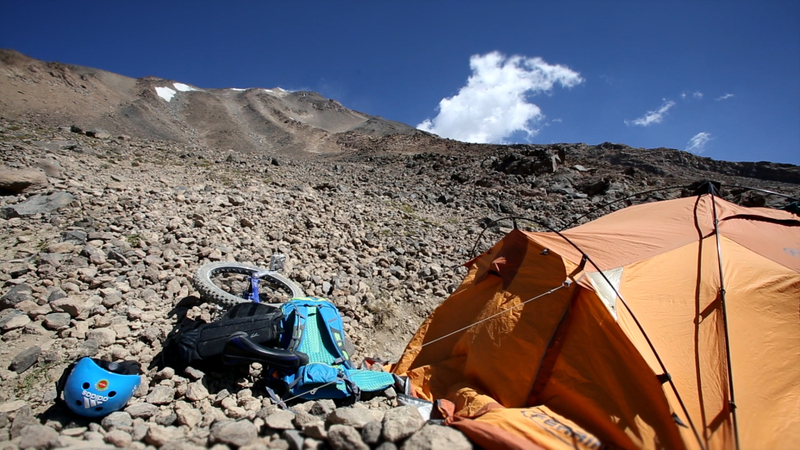 My attempt to descend the 5671-metre Damavand on one wheel was my biggest project to date, and also the most demanding. In my ten-year career as a mountain unicyclist, I have crossed the Alps, travelled five continents, overcome desert and mountainous terrain. This project has been two years in the planning and I have been training especially for it. Even so, problems with acclimatisation, injuries and lost luggage made my plans more utopian than I had thought. The journey started in the middle of the night at the international airport in Teheran. After film-maker Sebastian Doerk and I had spent an hour waiting for my second item of luggage, we discovered that my spare unicycle and my shin guards had apparently gone missing in Istanbul. This meant that we were over an hour late leaving the airport. Our guide, Mohammad Hajabolfath, was already waiting for us. 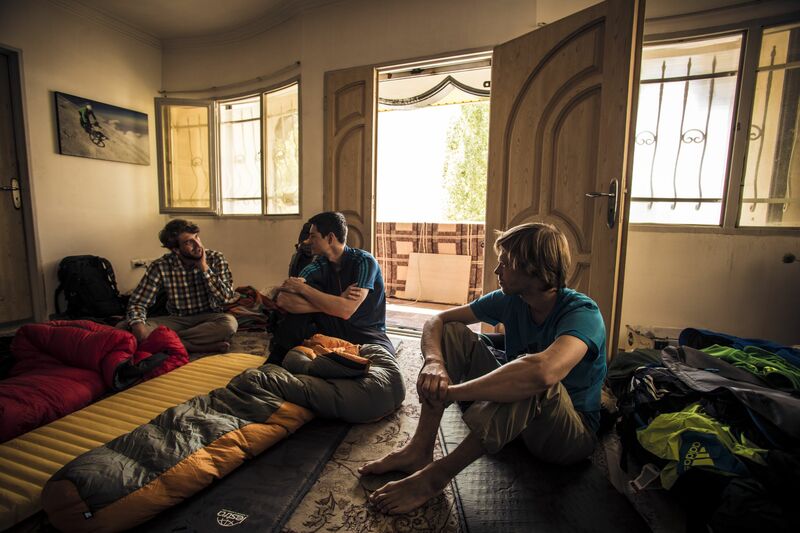 At three in the morning, we drove through the still bustling streets of Teheran, heading straight for our first camp at 2000 m. There we met the other two members of our team, two of my best friends, Fabian and Joschi, who were to accompany and support me in realising my plans. We had actually hoped to catch a couple of hours’ sleep at a mountaineers’ hostel, but for reasons unknown, they wouldn’t let us in. Even when we finally managed to get inside the place, we still didn’t get a bedroom. 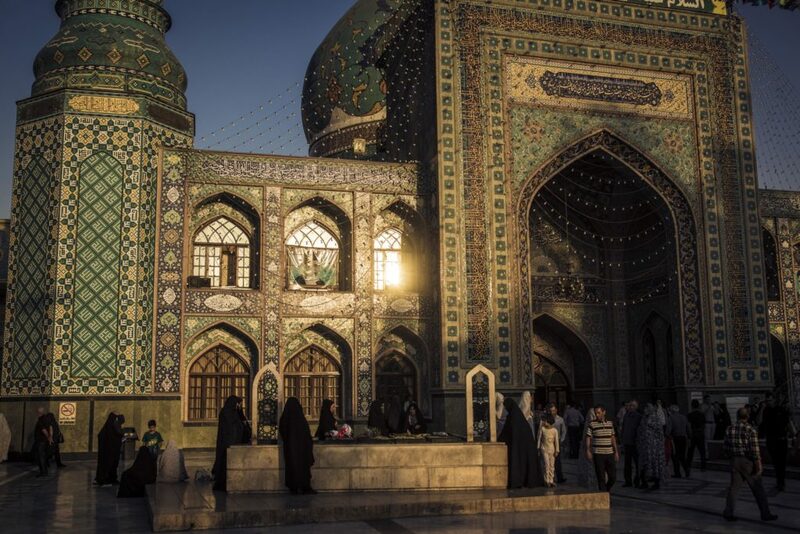 This was how we came to enjoy our first Iranian sunrise. Unfortunately, it didn’t do much for our level of fitness. Mohammad luckily had a plan B in place and took us to a friend’s house. There, we managed to get our heads down for a couple of hours in a carpeted but unfurnished living room. After a delicious breakfast of traditional lavash flatbreads, we immediately set off for the first mountain camp at 3000 m. We were able to rest our exhausted bodies, as we travelled there by jeep. Once we had set up camp and enjoyed a delicious meal prepared by Mohammad’s colleague, “Hadji”, we fell into our tents and slept like logs. As I didn’t have any spare shinguards with me, I covered the first stretch on Damavand the next morning without any leg protectors. 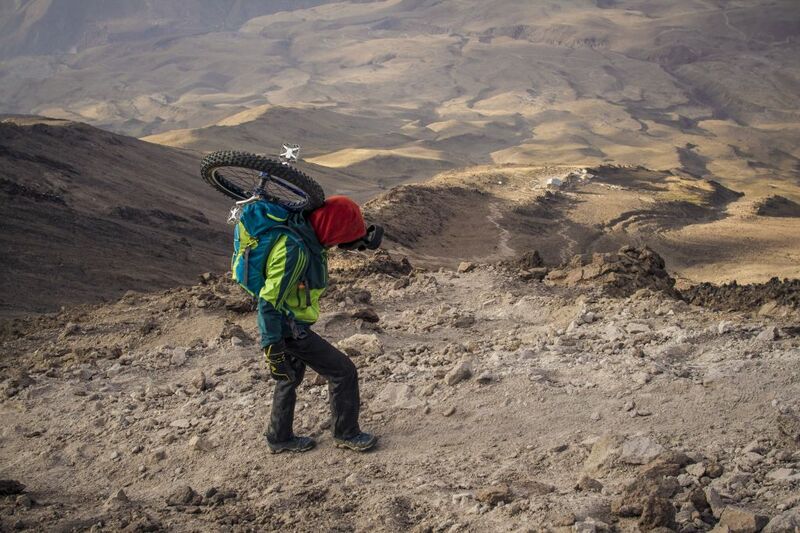 Even here, at 3330 m, riding was an enormous challenge. I had to go much more carefully, as banging against my sharp pedals could easily leave me needing stitches. 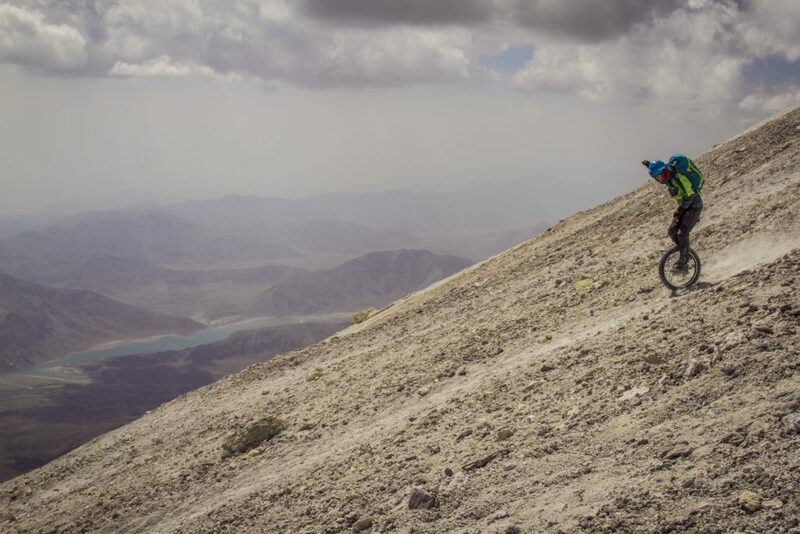 As more than 50% of Iran is desert, the trail is extremely sandy, meaning that I kept slipping and had to adjust my riding style. Not long afterwards, the whole team found out the hard way that the terrain really was much more challenging than in the Alps. On the way back to camp, Sebastian slipped and went down hard. At first, he got up and tried to keep going, but after just a couple of metres, it was clear that his ankle was badly injured. We tried to work out how we were going to get him back to Base Camp. 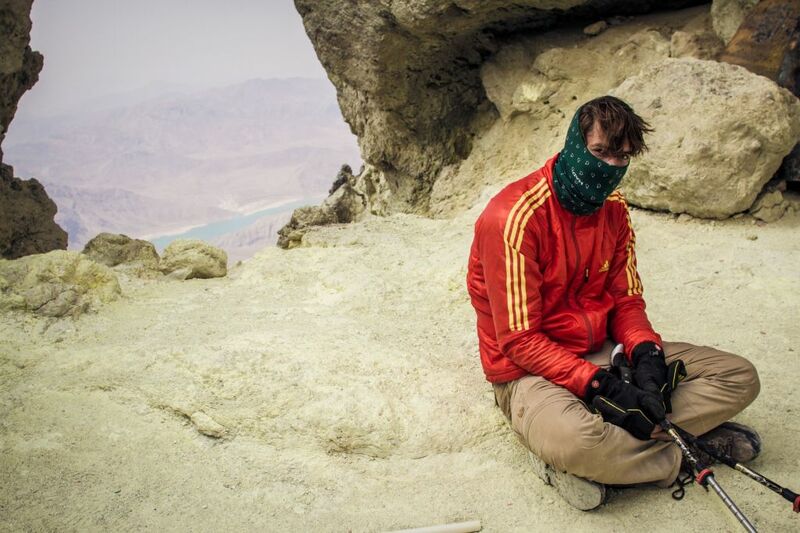 There’s no mountain rescue in Iran. Shortly afterwards, we were lucky enough to bump into a couple of locals out walking. They realised the predicament we were in and built a makeshift stretcher out of walking sticks and jumpers. 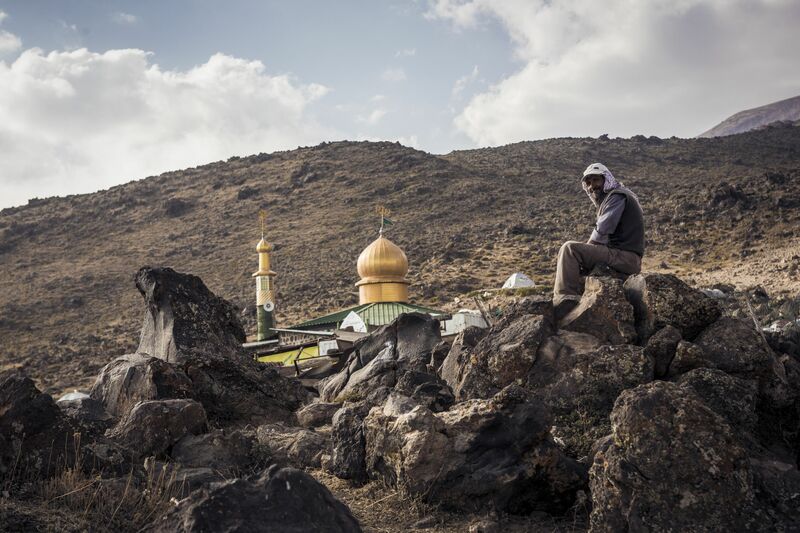 We finally got back to Base Camp and fairly soon afterwards, he was seen by a doctor who happened to be accompanying a group of morality police (policeman who ensure compliance with Islam) who were attempting to climb to the summit. As Mohammad had already set off to collect my luggage, we struggled to understand the doctor’s prognosis, as he spoke no English. Without success. Sebastian’s ankle was splinted with cardboard and a bandage and his foot immobilised. When Mohammad arrived back in camp, it was soon obvious that Sebastian’s adventure was over. Translating the doctor’s words for us, he told us that the foot was probably broken. Even though I didn’t have a great feeling about it, Fabian, Joschi and I didn’t want to call a halt to the project. The accident brought it home to me that if any of us had an accident, we were on our own. In considerable pain, Sebastian told us how his camera equipment worked, and then Mohammad drove him to hospital in Teheran. What that now meant for us was that we had to get to the High Camp, at 4200 m, without a guide. Confidently, we set off along the breathtakingly beautiful Trail. I kept riding back down the odd section, to get used to the surface. Once at the camp, we were pleased to note that we were physically fit, except for mild headaches. That changed dramatically about an hour later. In the space of a few minutes, all three of us got blinding headaches. We were not well. All movement made the symptoms worse. Even simple actions like blowing up the sleeping mats left us gasping for breath and in agony. Mohammad had caught up with us by now. Before we went to sleep, he assured us that we would soon be feeling better. With that hope in mind, we crawled into our tents at 9 PM. Outside, the temperature had fallen to -5°C. It got no better that night. Sleeplessly, I tossed and turned in the tent and came to the conclusion that as a native of the Ruhr, I was simply not cut out for high-altitude mountaineering. It was so unbearable that I was seriously considering taking my head torch and climbing back down to 3000 m, where I would be in less agony. But when I took hold of the tent zip, I noticed that the tent was frozen on the inside. I took this as a chilling warning not to climb back down. After what we agreed had been the worst night of our lives, we were soon getting up with the sun. 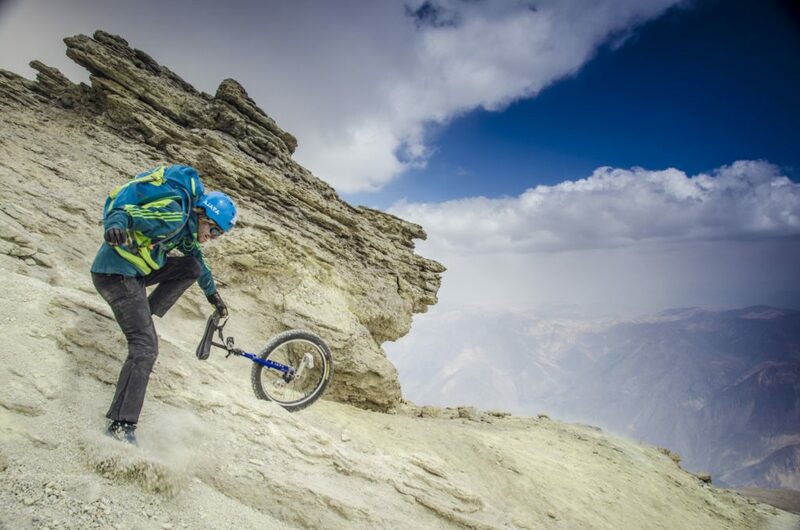 In the state I was in, there was absolutely no question of getting to the summit, let alone making a descent from it on a unicycle. But I was still absolutely determined not to give up, and so we decided to push back our acclimatisation tours and wait until our symptoms subsided a bit. By about lunchtime, they had. We set off in a more positive frame of mind to go a bit further up. This time, we had Mohammad with us, and he told us to keep our movements slow at this altitude. We realised that our biggest mistake the day before had been the speed with which we made for High Camp. 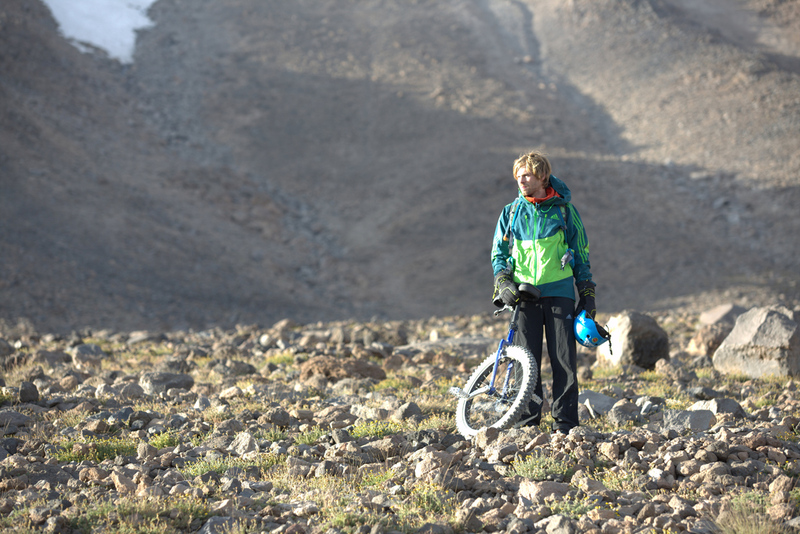 On the way down to the camp, I wanted to get in my first metres on the unicycle at way above 4000 m. I set off at a relatively exposed section of the trail. As I was trying to put my helmet on, the wind immediately snatched it out of my hand and it bounced about 10 metres down the track before coming to rest. Do I really want to ride my unicycle here, was the question running through my head. I took a few deep breaths and considered whether I felt safe. After a few minutes, I concluded that this situation was just bad luck and got onto my unicycle. It was amazingly good fun. I finally realised that a whole year of training, during which I had completely sworn off competitions to maintain an optimum state of preparedness, had paid off. Even so, I very quickly realised how hard it is to ride at this altitude. From a technical point of view, it was fine, but I was constantly out of breath. The descent into the camp went well, however. Fabian and I were already much better, but Joschi was complaining that his headache was getting worse. That evening, we decided to put off our push to the summit, to give our bodies a bit more chance to recover. A further acclimatisation tour up to 4800 m left me feeling half human again, for the first time. Despite everything, I didn’t particularly rate our chances of reaching the summit. Just the 1500 metres of altitude of stony, slippery terrain to take us up to 5670 m filled me with respect. We had also received the sobering news that the wind temperature at the summit was expected to be anything down to -15°C. In terms of clothing, we were perfectly well-equipped, but we were worried that the nozzles on our hydration packs would freeze. In the dry mountain climate, we had to drink between four and six litres of water a day. As we couldn’t put it off any longer, we packed our rucksacks in the early evening, so that we would be ready for our ascent at 4:30 AM the next day. That night was the first time that I was able to sleep without any pain, but I still kept waking up, purely due to nerves. This was now our last chance to reach the summit. If altitude sickness struck, it would take far too long to recover. But fortunately, I felt absolutely fine as we set out. Slowly but steadily, we climbed to 5000 m. Reaching this milestone was a huge success for all of us. However, shortly afterwards, it dawned on me that the next few hours were unlikely to be much fun. I needed to stop for a break more and more often. My unicycle, which by now I was having to carry virtually every step of the way, as the path was too steep to ride, felt like it weighed 30 kg, not 7 kg. Agonising headaches returned. Breathing was getting harder and harder. But at least I had the rising sun to warm up my feet and my pain subsided every time we took one of our many short breaks. 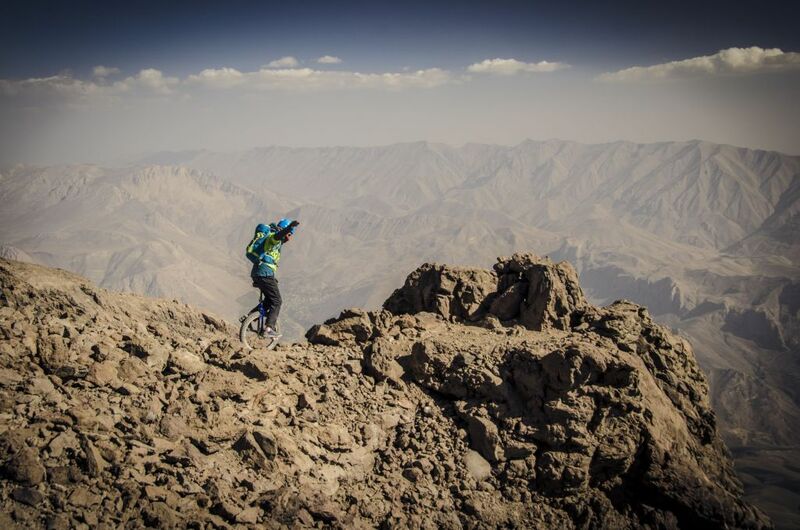 Mohammad, who was extremely physically fit, kept encouraging us and, slowly, the summit came into sight. But I was just too exhausted to enjoy the view. At some point I managed to pull myself together and look up. I realised with relief that the summit no longer seemed that far away. My head felt like it was stuffed with cotton wool. I dragged myself the last few metres upwards. Finally, we were at the summit, but there was not much time to celebrate. A quick team hug. 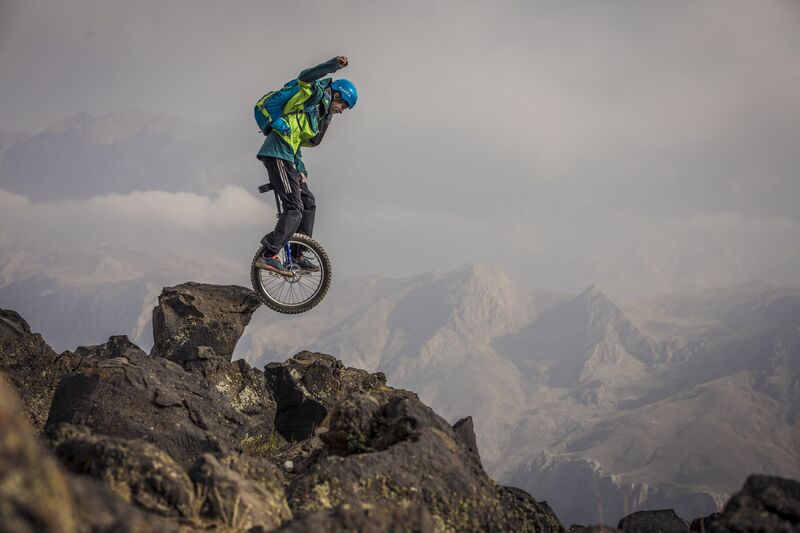 A picture with the unicycle at the highest point accessible by foot and then things started to change. When we arrived, the whole team had seemed fine, but we now noticed that Joschi seemed to be spending more time leaning on the camera tripod than he was filming, and that he wasn’t giving appropriate answers to our questions. We quickly realised that he was in far worse shape than we had thought. He had to get straight back down while he still had the strength. Even though he kept trying to tell us that he just wanted to sleep for a bit, we explained to him that he couldn’t stay at the summit any longer. Fortunately, we had a colleague of Mohammad with us, and he took Joschi and set off back to the camp. Now it was just Fabian, Mohammad and I at the summit. I was starting to feel a whole lot better than I had done on the way up. 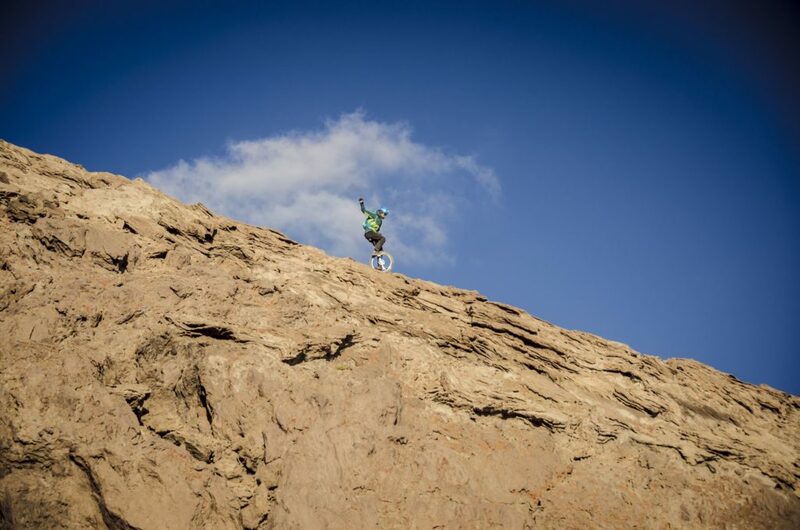 But when Fabian said he felt dizzy, we decided that I would have to start my highest-ever descent immediately. Apart from the thinness of the air, the constant smell of the sulphur coming out of the ground close to the summit was becoming unbearable. Fabian and Mohammad filmed and took photos, whilst I tried to expend as little effort as possible on riding the white lava trails. 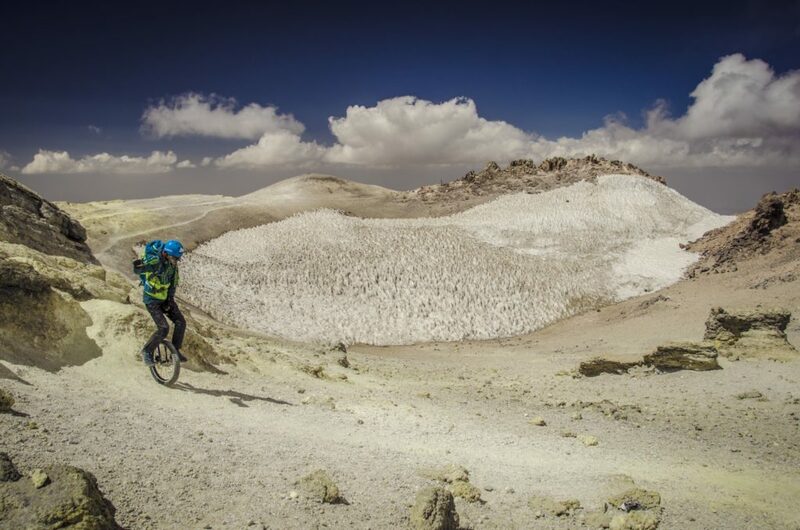 Despite my pain and effort, gliding downwards on my unicycle through this surreal landscape felt almost unreal. I soon realised that the terrain, fine lava sand peppered with stones, was similar to what you get in Israel and Morocco. Something I had experience of, at least. It was hard to brake on the slippery, steep slopes and my descent was getting quicker and quicker. Stones and dust flew up from my tyre and sometimes the best way of slowing down was simply to drop off the back of the unicycle. Even though my head still felt quite foggy, I started to enjoy the descent more and more. The vista was changing all the time. The mountainside next to the trail dropped steeply away to 3000 m, so that my view was like looking out of an aeroplane window. To have reached a point with a view like that through my own efforts made all of the difficulties worth it. Nowhere else in the world is there another summit which is so isolated, so exposed. Even the peak of Everest towers less than 4700 m above the surrounding landscape. To be able to come up here and do my favourite sport was to fulfil a dream I had cherished for a whole year. Again and again, I rode the most beautiful places on the summit plateau. 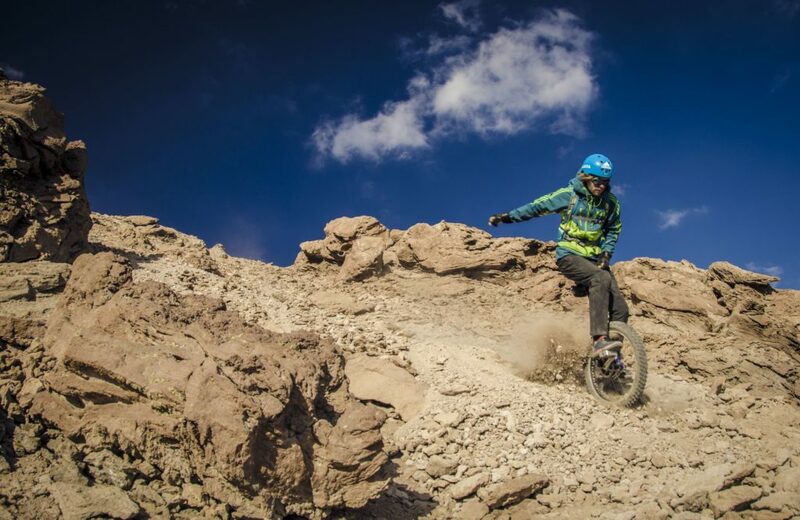 After hours of almost dreamlike unicycling, Mohammad brought us back to reality, reminding us that it was time to go down. We had been on the go for ten hours at that point and still had to descend 1000 metres through scree. With something approaching melancholy, we left the lava rock behind and returned to the desert-like, boulder-strewn, reddish yellow area below 5000 metres. Immediately, my strength left me. My headache was getting worse all the time and I was finding it more and more of a job to stay on my unicycle. I kept asking the others if we could rest for a bit and had to walk more stretches than I had hoped. Not far from our camp, we came across an exhausted hiker staggering like a drunk, who had had to turn back before the summit, and it made me realise how incredible it was that at least Fabian and I had reached our goal. Mohammad helped the hiker, as he probably wouldn’t have made it back to camp on his own. We walked and rode quickly, eager to get back to thicker air at last. 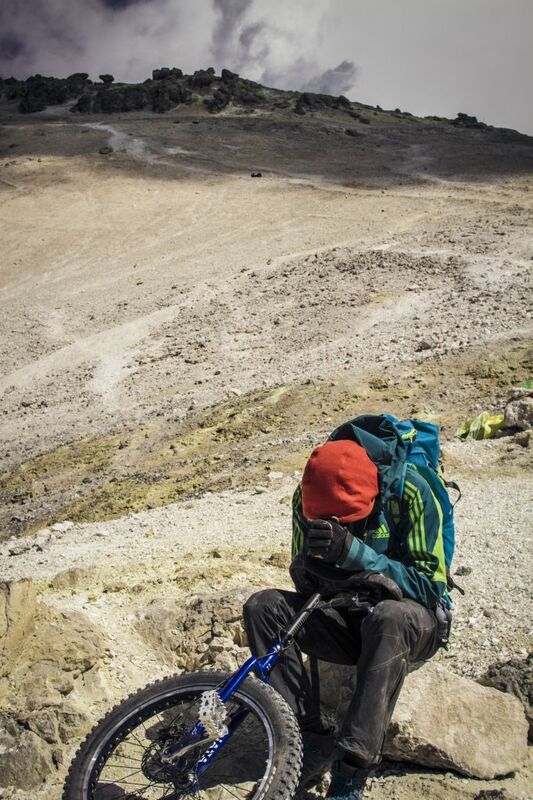 Below, when we reached 4200 m, we were delighted to see that Joschi was much better and sleeping peacefully in the tent. We joined him very soon afterwards. The next morning, we were straight off again, to descend the last 1200 m to our first camp. I was riding like a man possessed, often whole stretches at a time, so I had a long wait for my friends on foot down at the bottom. It was here that it properly dawned on me for the first time what an amazing adventure and yet what a successful trip it had been. 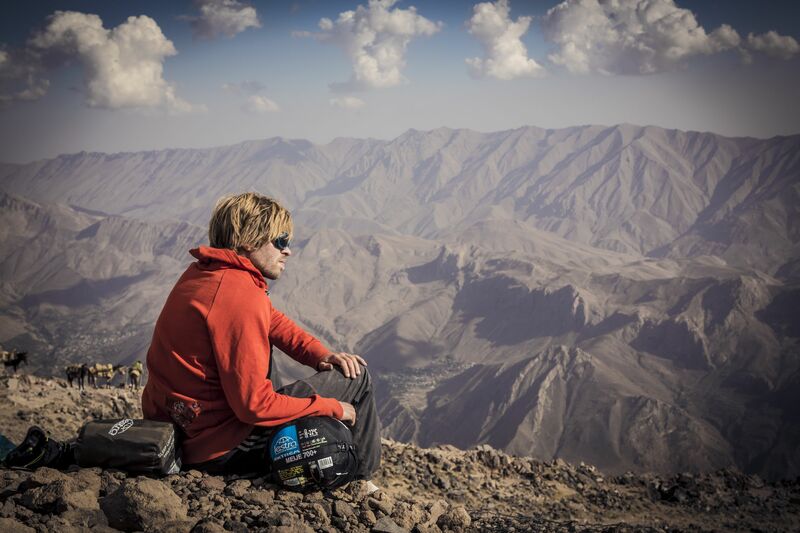 From Kaiserslautern to the highest peak in Iran in just a couple of days. From my orderly, Western and – for me – straightforward world to Iran, the so-called “Axis of Evil”. I had three days left to make sense of my experiences before I set off back home. 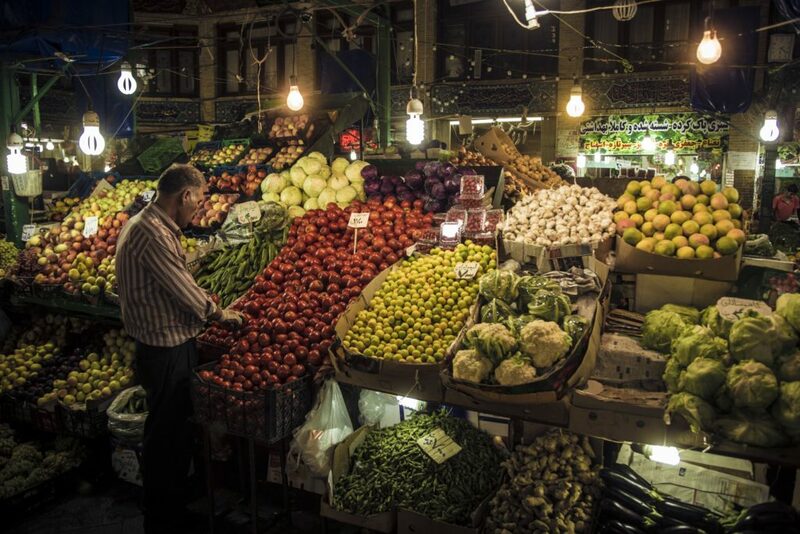 As well as my mountain descent, I had also had many wonderful experiences with the extremely hospitable Iranians. After all the negative things you hear about the country in the media, it’s fantastic to see that the people try to stay positive and are incredibly welcoming towards Westerners. And along with my suitcase of clothes which smelt of sulphur, I took countless memories and new experiences with me back to Germany. I now even look back on the hardships with fondness. Photos: Mohammad Hajabolfath, Sebastian Doerk, Johannes Schnebele.